Delpro shaftless reel stands are modular self-standing units of robust construction. Operator handling is reduced to a minimum as reels are lifted from the floor or pallet without the need for additional lifting equipment. Improved production speeds and reduced waste are achieved as precise tension control ensures that the quality of pay-off and reel-up is maintained over the complete speed and tension range. Reels held on pneumatic/mechanical chucks with support arms mounted on common cross bar. Arms are driven in and out on linear guides via a double acting lead-screw to accommodate less than half width reels without the need for adaptors. 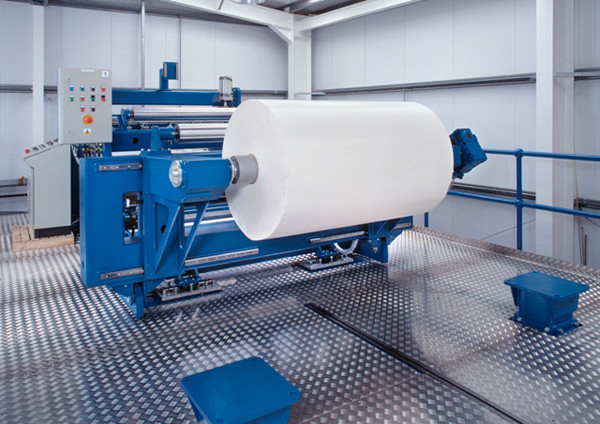 Pneumatically loaded lay on roll with integral spreader roll on rewinds for perfectly wound reels. Automatic web guide or manual side-lay.